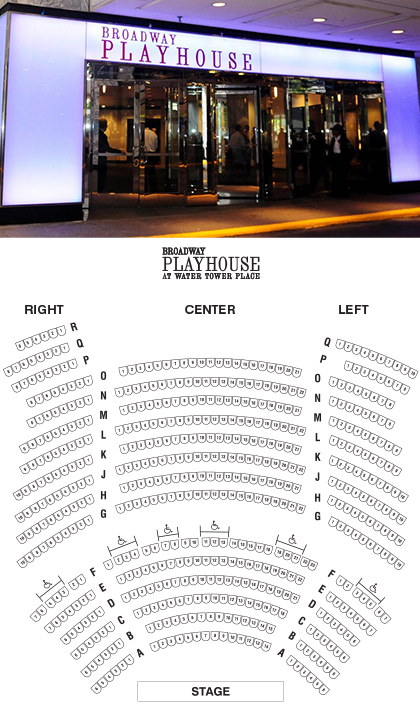 Broadway In Chicago’s Broadway Playhouse is located at 175 E. Chestnut St.Chicago, IL 60611 in Chicago, on the northeast side of Water Tower place, just behind the Ritz-Carlton. The theatre entrance is directly across from the back entrance to Water Tower Place. Before and after your visit, we invite you to grab a drink at the bar or enjoy the wide variety of restaurants and other shops within walking distance of the theatre, in downtown Chicago. Take the Kennedy Expressway (90-94) and exit at Chicago. Turn left to take Chicago east to Michigan Ave. Turn left onto Michigan Ave. and proceed north to Chestnut St. and turn right. Parking garage and entrance to the theatre will be on your right. Take Michigan Ave north to Chestnut St. and turn right. Parking garage and entrance to the theatre will be on your right. Take the Kennedy Expressway (90-94) and exit at Chicago or Lake Shore Drive north to Grand. Take Chicago East to Michigan Ave. (or Grand west to Michigan Ave. if coming from Lake Shore Drive). Proceed north to Chestnut St. and turn right. Parking garage and entrance to the theatre will be on your right. Exit at Chicago Red Line station. Walk three blocks east to Michigan Ave. Turn left (north) on Michigan Ave. and proceed north two blocks to Chestnut St. Turn right onto Chestnut. Theatre will be on your right, directly behind Water Tower Place. Exit at Chicago Brown/Purple Line Station at Chicago and Franklin. Take the #66 (Chicago) bus or walk about 8 blocks east to Michigan Ave. Turn left on Michigan Ave. and walk 2 blocks north to Chestnut St. Turn right onto Chestnut. Theatre will be on your right, directly behind Water Tower Place. #66 (Chicago), #146 (Inner Drive/Michigan Express), #151 (Sheridan), and #147 (Outer Drive Express). Downtown Chicago has limited street parking. We recommend using apps such as ParkChicago or SpotHero to find available spots around the theatre if you choose not to use the Water Tower Place parking garage. Please allow ample extra time if you are looking for street parking.